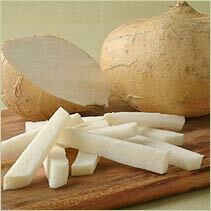 The Frederick News Post food section had an article about Jicama this morning called “In search of Jicama“. I love Jicama. It’s kind of like a large crispy, sweeter, water chestnut if you’ve never had it. We have a recipe for jicama-watercress salad that is a must have with paella. In fact I can’t have one without the other. The problem is I am almost always in search of jicama too. I can’t find it anywhere with regularity even though it’s in season late fall to spring. Anyone have any tips? There was another nice article in today’s Frederick News Post about Linganore Winecellars. They must be paying them or something. Ostensibly it was about pairing the right wine with food, but all of the wines featured were from Linganore Winecellars. Honestly I’m not complaining though. As I said in my earlier post I am always excited when any local winery gets press. I figure anyone trying to make a go of it here in our region is certainly doing it for love and not with any hope of getting rich, so kudos to them and give them all the help they need. I do have a couple of beefs- OK really maybe one thought and one gratuitous swipe. The first thought is that one of the reasons why I think wine intimidates people is they are afraid of breaking “the rules.” I have said before and I’ll stick by it: the only real rule you need to follow is drink what you like, but don’t be afraid to try new stuff. Articles on rules tend to perpetuate the myth. The only successful way to pair in my opinion, since there can be so much variation within the same varietal even, is to build up your own palate database and apply it to the dish on hand. Now my swipe. And just like that last little sweet on the holiday platter I wanted to pass it by, but after standing there and staring at it I just couldn’t resist. FNP is one of my favorite targets. It is Pinot Noir not Pinot Noire! I guess they have been watching too much film noire.